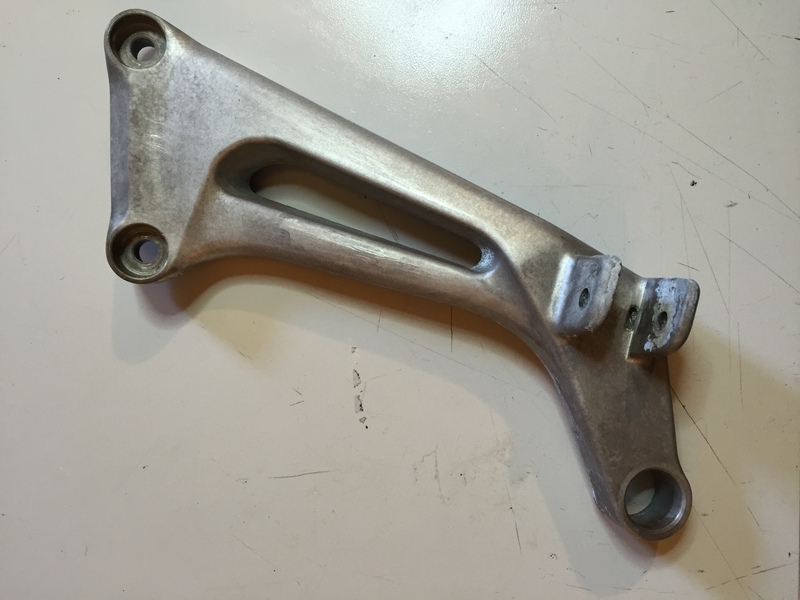 Has anyone had any success with removing the stock Honda powder coating from aluminum parts. I am trying not to sandblast them because it removes so much detail, rounds off edges etc. I tried some paint stripper which was touted to "strip epoxy paint" on the today. They sat coated with stripper for about 3 hours, result... Zip! Last edited by Fastguy59; 06-05-2016 at 12:22 PM. We have this nasty stuff in our powder coating shop that they use, I'll find out it's name tomorrow. Pretty sure you're not dealing with powder coat Bobby. 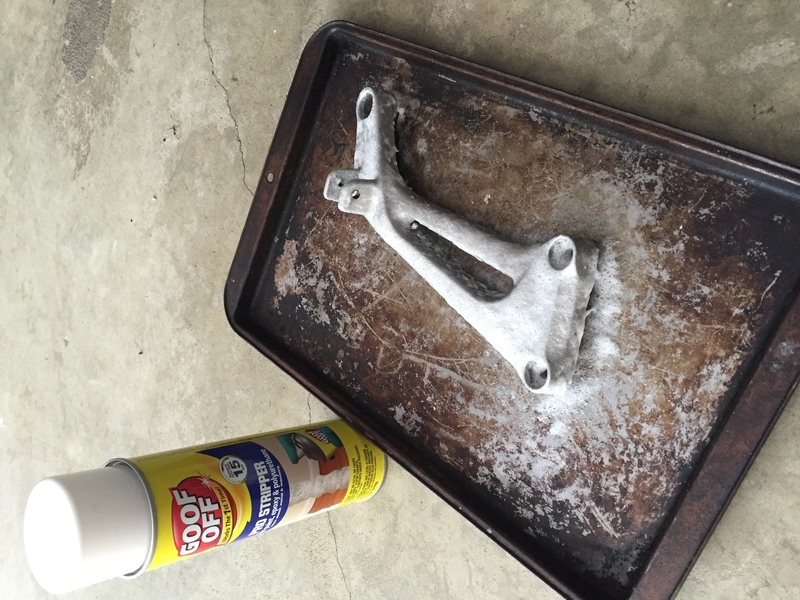 Powdercoat is removeable with acetone, but it takes a lot of it and some rubbing.... I know from experience. 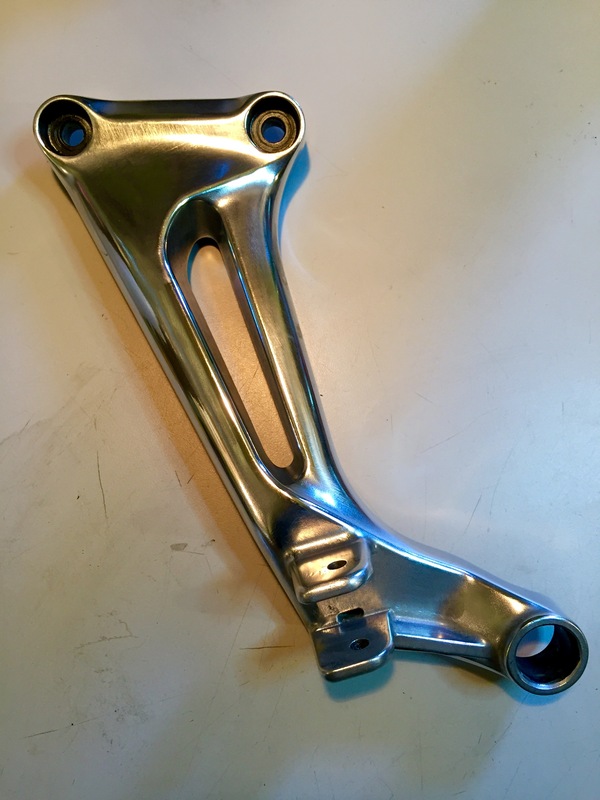 I have been informed that the rear peg hangers are silver anodized... This throws a wrenc in the works! Those are the ones I sent ya? Maybe have them media blasted with walnut shells. They certainly didn't look anodized. Last edited by CruxGNZ; 06-05-2016 at 06:45 PM. Yes Crux, they are the ones you sent me. Yeah that's what I thought, usually silver anodizing has that nice soft "glow" to it, but what the hell do I know anyhow! Lol! I have my fabricator doing up two different kinds of low mount exhaust can hangers to eliminate them at some point. Okay, the product they use over in our powder coating shop is called B16 Industrial paint stripper. This **** is nasty. Use in an extremely well ventilated area! Do NOT let this get on your skin! Respirator is HIGHLY recommended. And, of course, eye protection. You have been warned! It works well but some light media removal is still needed. Thank to all that answered. This weekend I will give the oven cleaner a try and post the results with pix! So EZ Off worked great! Took the anodizing right off! The first one came out great, the second one I over cooked it a bit as I got distracted by a client phone call... Here is a pic of the stripped, but over baked one! Last edited by Fastguy59; 06-30-2016 at 06:26 PM. Now a pic of the first one with a half-assed polish job! What are you using to polish it? 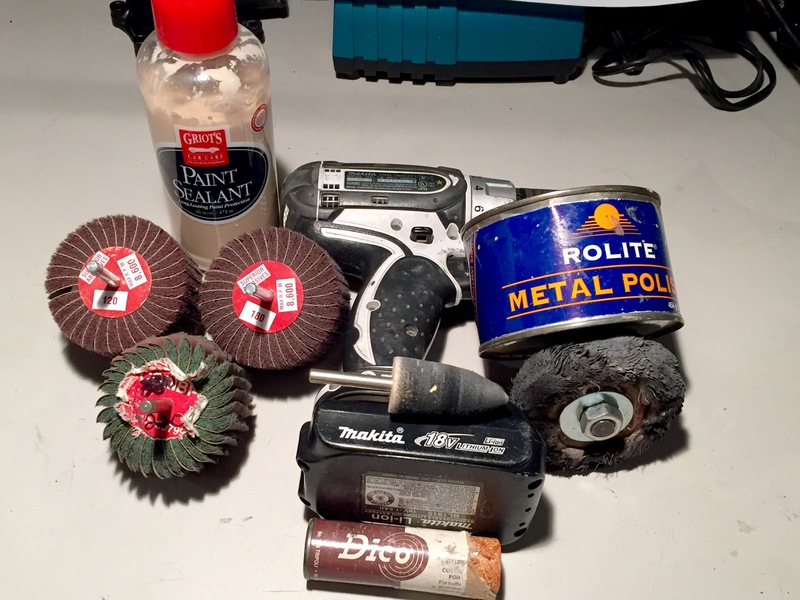 Do you have a polishing wheel, or are you using elbow grease? I know some of us would like to know the steps you took to get them to look good. So here it goes.. Oven cleaner, then a scubbie sponge with dawn dishwashing detergent, blown off with an air gun. Makita drill with a 120 flap wheel take out all the major imperfections keeping the grinding grain going one way, then cross grain at 90 degrees until you can't see the previous marks, repeat with 180 flap repeat with 220 flap (ideally you should go all the way to 600 grit) then buffing wheel with Tripoli compound, the Rolite metal polish on a buff or a felt come, buff the bejesus out of it with a flannel cloth until no black remains, then seal it with Griots paint sealant... Crux thanks for the mint pieces to start the process with! Last edited by Fastguy59; 06-30-2016 at 06:22 PM. Soon as you're done with your Hawk, I'll ride mine up to ya and fly home. You'll need something to keep busy when it's done.